Just as the citizens finished expressing their appreciation to King Pṛthu, four sages entered the arena, descending from the sky and shining as brilliantly as the sun. 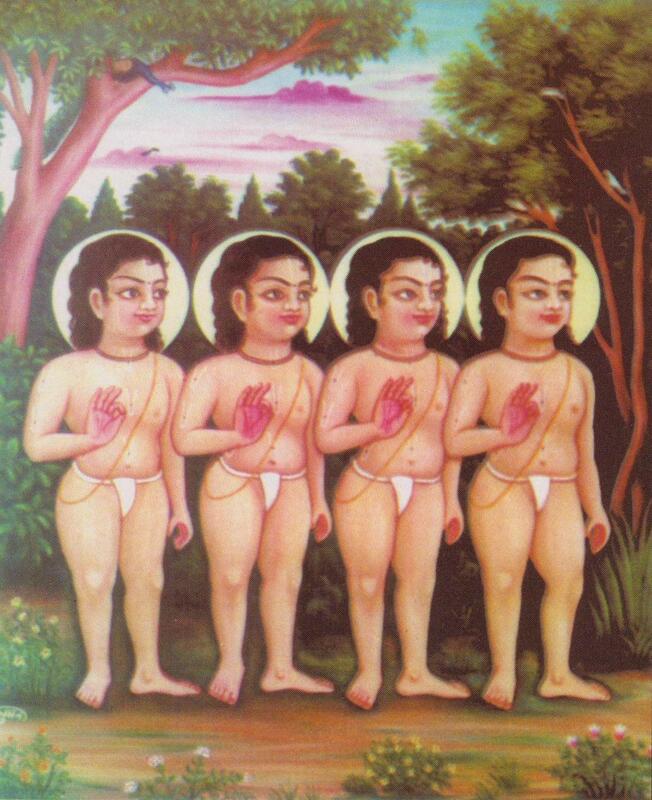 The King and his retinue recognized them as Brahma’s original quadruplet children. They all stood up to greet the sages, as eagerly and naturally as the senses arise to greet their desired sense objects. First, it shows that the four sages were obviously respectable – as much as a voluptuous woman is obviously desirable and attractive, there is no denying it. There is a lot of artificial respect given these days, because no one really has many genuine good qualities. Therefore rules and traditions and cultural morrays have to be put into place and enforced to insure that the people who thrive on respect continue to get it. This is the system of respect that flourishes in kali-yuga, in the absence of truly respectable people. When a person is truly respectable, we automatically respond accordingly; just as our saliva starts to flow upon seeing and smelling a wonderfully delish, fresh, hot plate of excellent food. Second, it shows that King Pṛthu was not “diseased.” Excellent sense objects do not always arouse the senses, for example, if the senses are weak and ill. A diseased person does not have the spontaneous reaction to delicious food that a healthy person has. Similarly, in kali-yuga we are all diseased in our interest of what sages have to offer. Therefore even if a self-evidently exalted sage comes into our midst, we do not respond. We prefer instead to continue offering our pretentious respects to the powerful personalities officially endorced by the leaders of our organizations and societies – because we are diseased; we do not have interest in the wisdom of sages, we have interest in obtaining better chapattis and more comfortable coushins, and maintaining a roof over our head and meals in our plates. So, two things are required: an excellent sense object and healthy senses. Then there can be enjoyment, and the senses spontaneously awaken for it. Similarly there must be a genuine sage with, and there must be a person sincerely interested in true wisdom. Then the sage will be happily and warmly welcomed and wisdom can flourish. Under the influence of their glorious nature, the civilized king approached them with humble posture, and very respectfully welcomed them properly with offerings and seats. He personally washed their feet, and then bathed the knot of hair atop his own head with that water. He did this in front of everyone, so that everyone would know his opinion of the exalted sages, and the proper behavior even a king should show to the wise. Previous Karma in the Spiritual Realm? Next How to Respect Sadhus, and How Sadhus Avoid Respect.